When it comes to dry eyes treatment you can do at home, many are still confused. Here are some easy to use treatments that won’t cost you a fortune and work very well. Perhaps your eyes are just tired and overworked. Consider a warm compress to ease the irritation. This can help to open up the clogged meibomian glands that are irritating your eyes. It helps to release some of the crusty matter that makes eyes irritated. Keep in mind that you’ll need the temperature to be around 108 Fahrenheit and that you’ll want to leave it on your eyes for about 10 minutes to get full results. Try this twice per day to see if it helps. Everytime you blink you’re lubricating your eyes. If you’re using a computer or a smartphone or anything else that is from the digital age, your eyes are strained and overworking to deal with the glare. This can worsen dry eyes. Make an effort to look away from the digital screens frequently and blink more often to help lubricate the eyes. Do a complete, full blink and gently squeeze the eyes shut to help improve the dry eye with this method. If you’re working on a computer or reading using an online device, take more breaks. Look away or walk away from your computer screen at least once for every 20 minutes that you’re using the screen. Use the 20-20-20 rule. Look away every 20 minutes at something that is at least 20 feet in distance from you and do this for at least 20 seconds each time. It’s ideal for helping to relieve eye strain. Eyeliner and eye makeup may clog the pores and openings in the eyes and tear ducts. This can lead to crusty matter as well as dry eyes. Be very thorough when removing eye makeup. Especially eyeliner. After you’ve finished consider a warm compress to round it out and make sure that all traces of makeup are removed. This can help greatly especially for those who are dedicated eyeliner users. Always wash your face and clean your eyelids prior to going to bed. 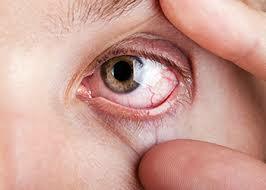 Gently wash the eyelids to remove any bacteria which may cause blepharitis (dry and itchy eyelids). Use a warm moist washcloth and allow your eyelids to be cleansed. Always be very gentle on the eyelids and don’t pull or tear at them as this can cause damage to the delicate skin on this area. Gently scrub the lids with a very mild cleanser that is designed to be gentle on skin. These dry eye treatments are easy to use. You should see results within just a day or so of trying these dry eyes treatments.